Playing online horse games is a great way for girls who love horses to have fun. There is so much do with these games and the best part is that many of them are free. No matter what discipline you love, English or Western, there is a game for you. Girls enjoy interacting with other horse lovers and competing in all of the neat events. Virtual online horse games are extremely realistic and offer an opportunity for every horse fan to learn something new while having a great time. 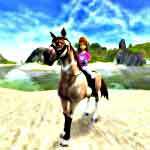 Create personal avatars, breed and train horses and compete in some challenging events. Play online horse games on your PC, or Mac.